Part of the Hon line and the Koya line (Nankai Electric Railway Co., Ltd.) from Namba to Hashimoto (in real life the train continues further on from Hashimoto to Gokurakabashi) with a Limited Express alternative for the class 30000 or an Express alternative for the class 1000 train. A Sub-Express alternative from Namba to Rinkan-Denentosi (2 stations before Hashimoto) for the class 6100 train. Also 2 Semi-Express alternatives from Namba to Izumichou that uses a part of the Hon line and Koya line, then to continue along the Semboku-Kosoku line (Osaka Prefectural Urban Development Co), for the class 5000 train. The tracks for these lines are 1067 mm gauge and the lines are electrified (1500 V DC). No landscape details outside the railroad itself. Line map of railroads and subway in the Osaka area (Acrobat document). For the alternatives towards Hashomoto and Rinkan-Denentosi, follow the Hon line (main line, blue-green at the map) southwards from Namba to Kishinosato Tamade, then the Koya line (the sun line , blue-green line at the map) southeast to Kawachi-Nagano and further on through Amami towards Hashimoto. For the alternatives to Izumichou, follow the Hon line (main line, blue-green line at the map) southwards from Namba to Kishinosato Tamade, then the Koya line (the sun line , blue-green line at the map) southeast to Nakamozu, from there further on to southwards on the Semboku-Kosoku line (pink line at the map) to Izumichou. 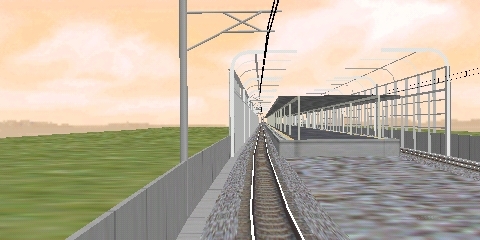 Stations at the lines of the Nankai railroad. The main line is called Hon . Click at Map by a station's name to show a map over the station and its closes surroundings. Stations at the Semboku Kosoku line. Click at Map by a station's name to show a map of the station and its closest surroundings.